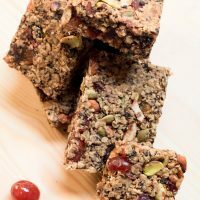 These Fruit And Nut Granola Bars have all the nuts you like and is loaded with dates, raisins and more. 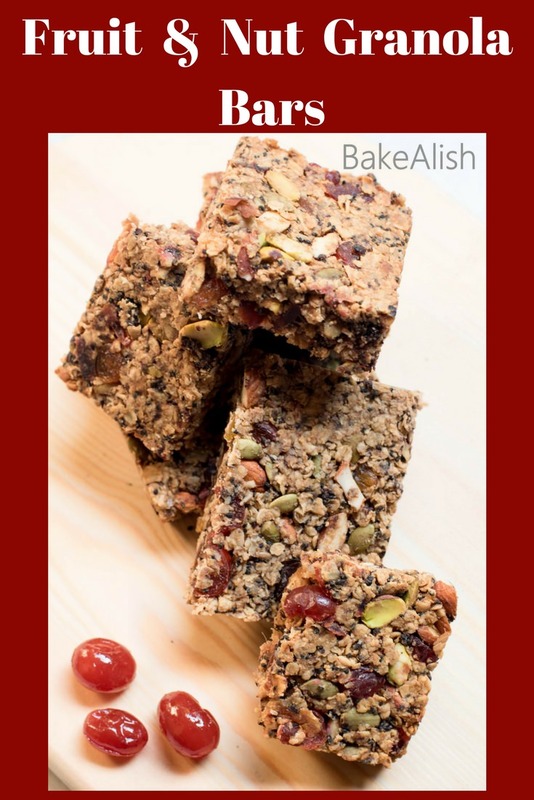 Its a very basic granola bar recipe, you can add whatever nuts and dried fruits you’d like in these healthy bars. These simply taste great and is a perfect munching option when you need a snack. 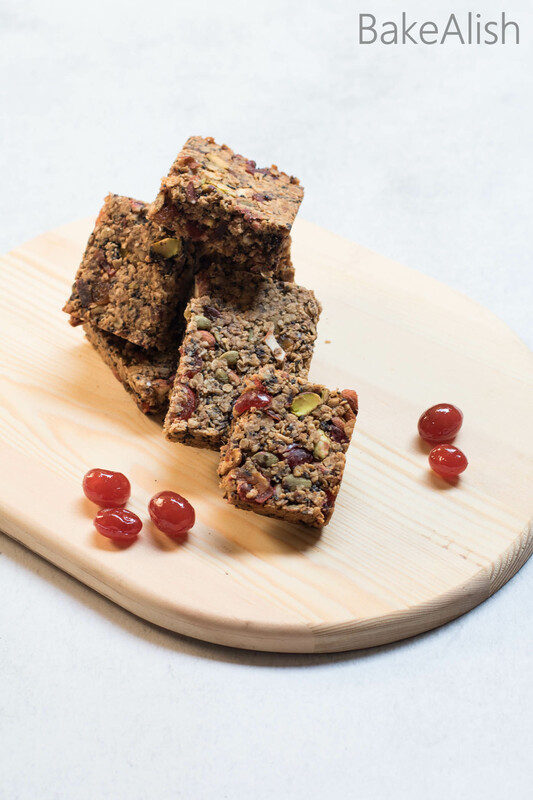 These Fruit and Nut Granola Bars have a blend of a lot of ingredients which also include the goodness of seeds along with oats. I’ve added all the nuts of my choice along with fruits like dried cherries, raisins, etc. 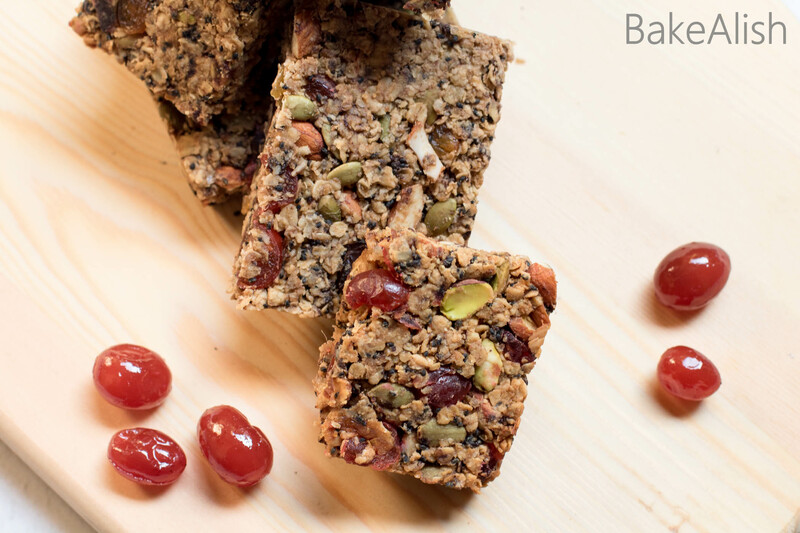 You can add whatever nuts and raisins that you enjoy munching on. These granola bars taste great however they do not cut into perfect shapes since the mixture is a bit crumbly. I do cut my granola into bars or squares but while doing this you will find some crumbs all around. However, this crumbly mixture has a perfect feel when you bite into them, not too firm nor too crumbly. In this recipe, I’ve used pumpkin seeds and chia seeds. Go on an add some more seeds of your choice. Whenever you add seeds, it is essential to toss them in the oven before you combine it with the other ingredients. This brings in the real flavor of the seeds at the same time adds a good crunch. Make sure to line your baking dish with parchment paper before you throw in the seeds onto it. This will make sure the seeds don’t burn. Do not chop the nuts fine, you want it to be chunky so roughly chop them or just cut each nut into two pieces. When we say fruits, we not using fresh fruits but dried. 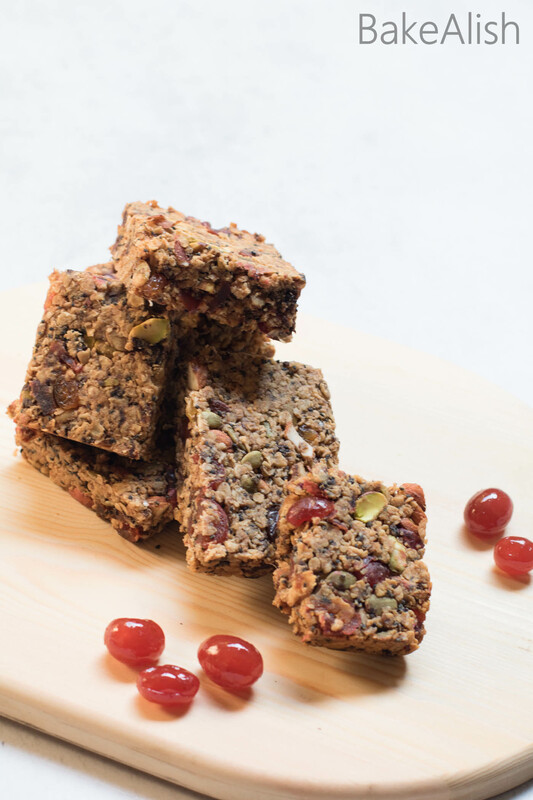 In this recipe, I have used dates, raisins, and glazed cherries. I’ve chopped them roughly making sure they’re chunky. Do not toast them in the oven. While making granola, you have a wet mixture and a dry mixture which needs to be combined together. To bind the granola mixture we add nut butter. In this recipe, I added peanut butter being my nut butter but go on and add whatever nut butter you’d like. I sometimes add almond butter instead of peanut butter and it goes really well. Before you combine all the ingredients in a bowl. You need to make sure you toast the Oats in the oven for 20 mins at 160 degrees. Keep tossing the oats every 8-10 mins until they get slightly crisp. For this recipe, I’ve used instant/quick oats. You can even use regular rolled oats and follow the same process. While the oats are getting toasted in the oven, place the nuts & seeds in the oven as well. Toast at the same temperature but for only 10 to 12 mins. 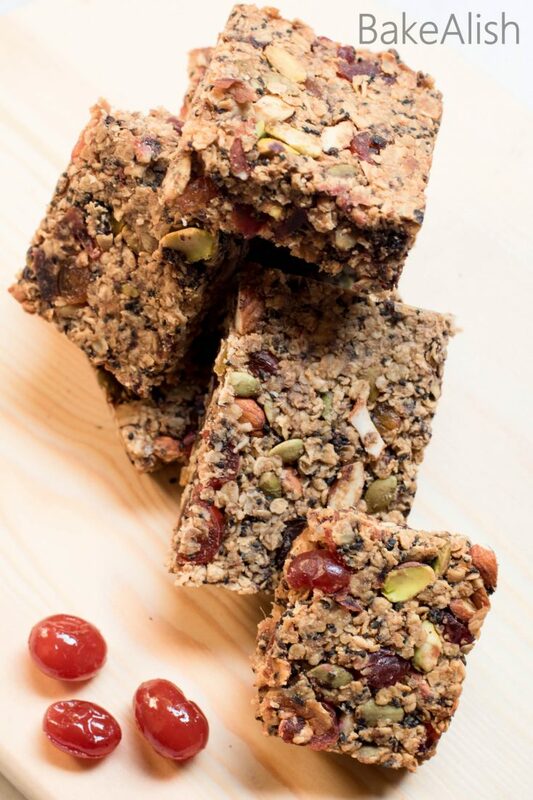 Make sure to line your surface with parchment paper before you throw in the oats, nuts & seeds onto the baking tray. Line 2 trays with parchment. Onto one tray spread the oats and on the tray spread the nuts and seeds. Toast the oats in the oven for 20 mins and the nuts and seeds for 10 mins, both at 160 degrees C.
Once toasted transfer the oats, nuts, and seeds to a bowl and let cool for 10 mins. To this bowl add the chopped dates, chocolate chips, chopped glazed cherries, sugar, cinnamon powder, and salt. Toss really well. Place a pan over medium heat and add the peanut butter. Stir constantly until the peanut butter has melted. In another bowl, add all the wet ingredients: Melted peanut butter, honey, unflavored oil and orange juice. Whisk this mixture and combine it with the dry ingredients bowl. Mix really well at this stage. The mixture should feel moist once the wet ingredients have been added. Transfer this mixture to a 7-inch square baking dish lined with parchment paper. Using the back of the spoon, press the mixture onto the baking dish and even out the granola mix pressing all of it into the baking dish. In another bowl, add all the wet ingredients: Melted peanut butter, honey, unflavored oil and orange juice. Whisk this mixture and combine it in the dry ingredients bowl. Mix really well at this stage. The mixture should feel moist once the wet ingredients have been added.